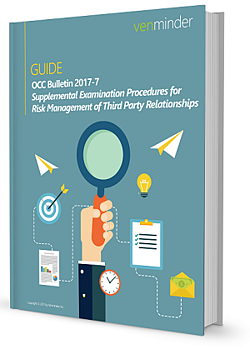 Have you heard about the new third party risk management regulation, OCC Bulletin 2017-7 that was released last year? It puts responsibility for third party risk management firmly at the Board level and lists some of the most prescriptive guidance on due diligence standards and the key categories of risk yet. Even if you’re not an OCC financial institution, it’s prudent to make sure you’re at this level of maturity in your third party program as these represent the most up to date and best in class practices.